The addition of water features to your outdoor spaces can increase the beauty of your outdoor landscaping design and add a welcoming atmosphere for your guests. The harmonious sounds of water singing as it flows along has a great way of relaxing people. We love the ambiance that water features create in an outdoor space. Sitting outdoors listening to a water feature helps you relax and enjoy the beautiful weather. Read our recommendations below to get inspired and find the best water feature for your landscape! Are you looking to create a natural-looking, relaxing atmosphere? Still water ponds or reflection pools can offer a perfect place for deep thoughts and intimate conversations. These areas are easy to incorporate into any type of home or business landscape. You can make these pools of water ground-level to mimic natural water ponds, or with stone or brick foundations in yards lacking a natural water spring. Furthermore, these reflection pools or still water ponds look sensational surrounded by lush plant life that can draw in local birds, colorful butterflies and other nearby wildlife. If you have naturally hilly or inclined areas of your backyard, you may want to consider transforming a portion of your outdoor property into a sparkling waterfall. Traditionally, waterfalls offer a striking visual focal point while creating an outdoor ambiance that’s almost bewitching. A skilled and talented landscape expert can make use of natural property high places to add downward flowing cascades of gushing water. This looks terrific with any style of landscape design. You can enjoy these larger water projects from farther distances as well. This is perfect when viewed from indoor picture windows and upper level balconies. It’s a great way to differentiate your landscape from the “average” and make your neighbors envious! If you don’t have the necessary room for a large waterfall, you can still get some of the same inspirational effect by trickling water through a rock garden. These can run gracefully over and through a colorful back or side yard rock garden. Having staggered levels of natural rocks and artistically planted colorful bursts of flowers enhances the feeling of being immersed in a cool, shady forest retreat. Your landscape professional can create an ideal rock garden with a natural-looking water scene, complementing the surrounding scenery. Perhaps your outdoor setting is not conducive for any high-maintenance water additions. There are some amazing, easy-to-care-for water focal feature items that don’t require a runoff pond or other water drainage source. Using these outdoor enhancements decreases the safety requirements of larger scale runoff water bodies like ponds and pools. Adding a simple bubbling features even creates more visual depth and water movement. There are plenty of spectacular water additions that look incredible yet require little maintenance. 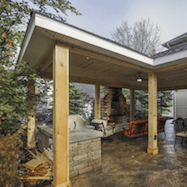 There are lots of contained water structures made to highlight a backyard patio, deck or pool. Some homeowners have even mixed warming fire features like outdoor patio fire pits or fireplaces with cooling water effects. This type of feature can even be used in yards that don’t have much grass or homes with smaller outdoor patio sites. These come in cascading waterfall-like designs over brick walls, smaller trickling water spout options and even walkways with sprays of overhead water arcs. 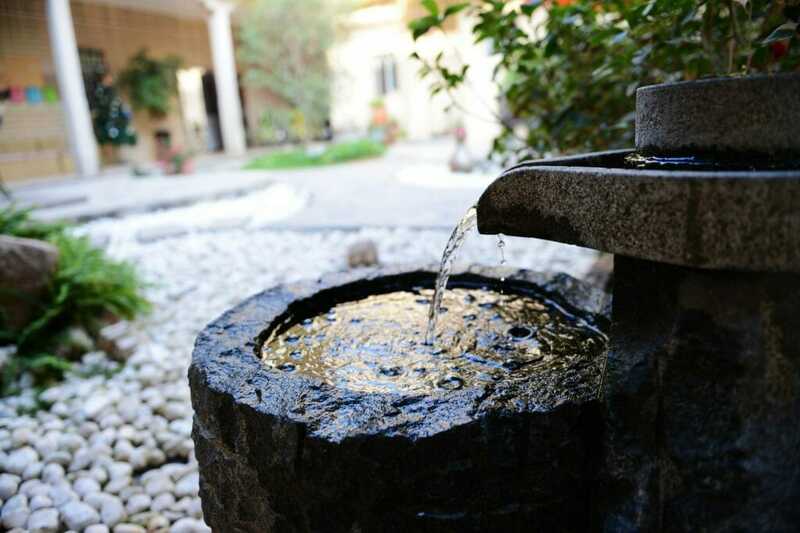 Water fountains have always been a popular addition to a backyard landscape. These easy-to-maintain water features come in a wide variety of sizes, designs and colors. Some are elaborate with multiple jet sprays that are motion-activated. Others are less fancy, yet remain eternally elegant in their simplicity. These make outstanding additions to patios, side yards, flower gardens or just about anywhere. Many of the newer models have water saving features, solar powered lights and come in a large variety of design, material and color choices. If you have a beautifully-crafted pool in your backyard, there are many features that you can add to highlight it. You can incorporate waterfalls that flow into your pool, which also serve as a fun place to play in for kids! 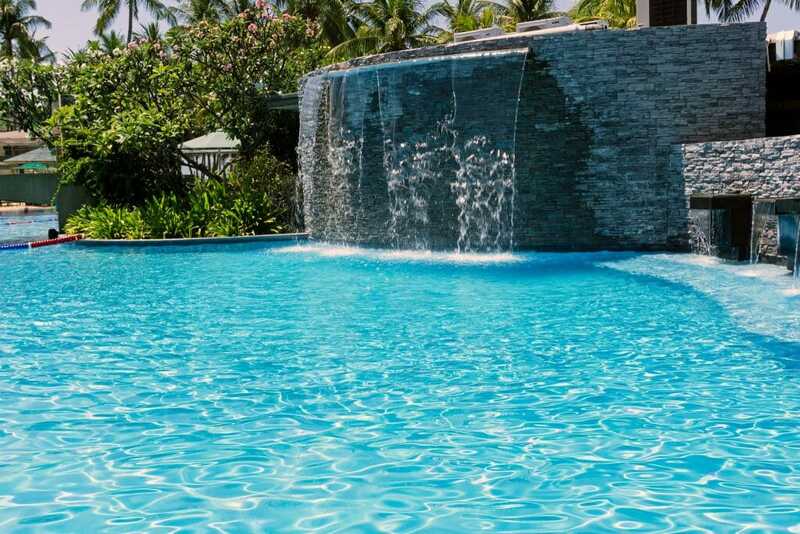 You can add jets that squirt arcs of water into the air around your pool. Or, your landscaper can create a unique poolside fountain that adds drama to your backyard. Give it some extra flair by adding fiber-optic lighting to help it pop at night! Water features help you create an outdoor oasis that inspires peace, relaxation, and good conversation. Imagine having a tranquil outdoor spot with a comfortable bench or chair to unwind after a stressful day. Having your own tranquil spot helps you find a refuge from indoor noise and chaos. Adding unique water features can also enhance the appearance of your outdoor living spaces and add intrigue to your present landscape or hardscape design. 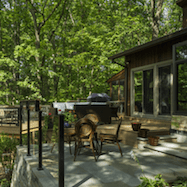 You may want to consider adding an outdoor kitchen area, warming fireplace, pool, or fire pit, too, if you don’t have them already. 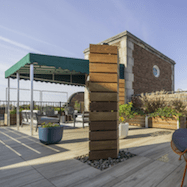 Discover the benefits of adding visual beauty and relaxing water sounds to any outdoor space by browsing our design gallery! Or, call us today to discuss your vision and get started on your next landscaping project!